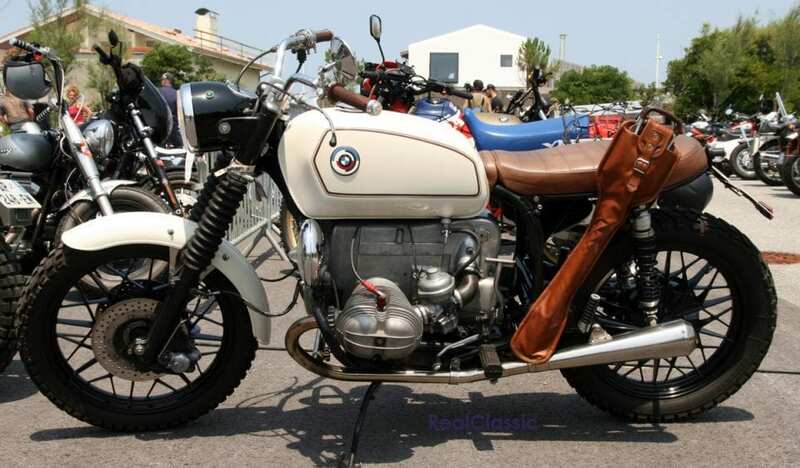 motos de collection, art, musique et surf! 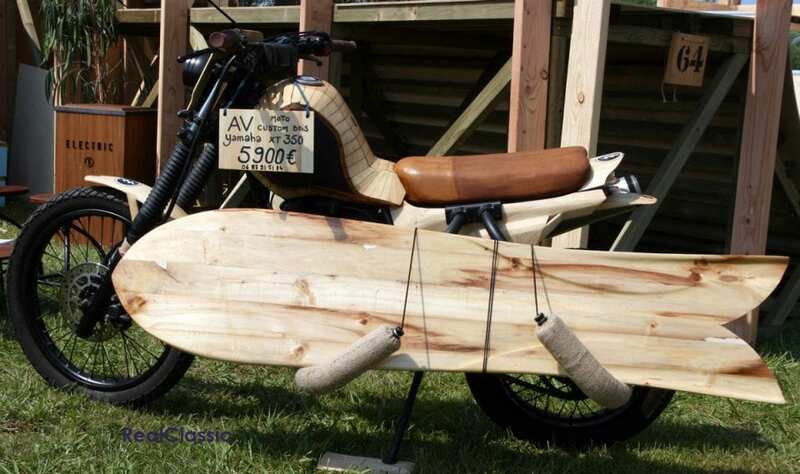 interesting motorcycles, art, music and surfing. Even that misses out on some of the breadth of entertainment available. 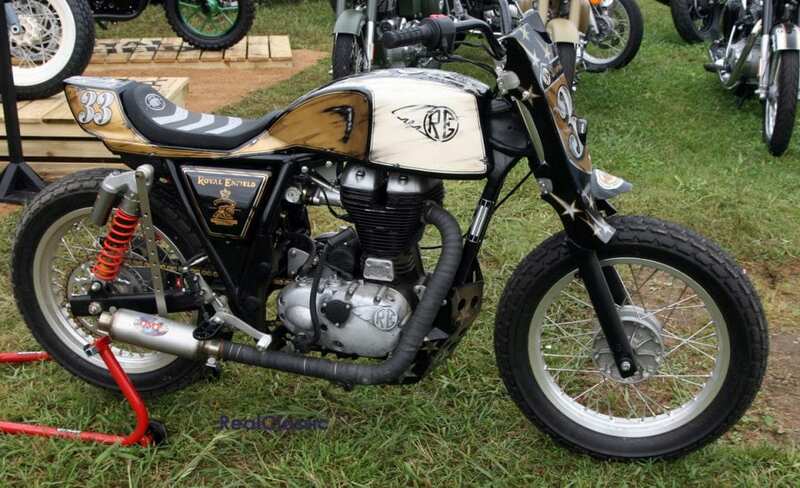 There are at least two types of motorcycle races available, there is a surfing competition, there’s a skateboarding competition, there are old bikes, customised bikes, new bikes, clothing, music, art exhibitions, rides out, posh watches, and so on. I suppose the unifying factor in all of this, apart from the fact that the organisers find it interesting, would be that it is all cool. That is cool as in stylish, fashionable and chic. Not to mention not taking itself too seriously. 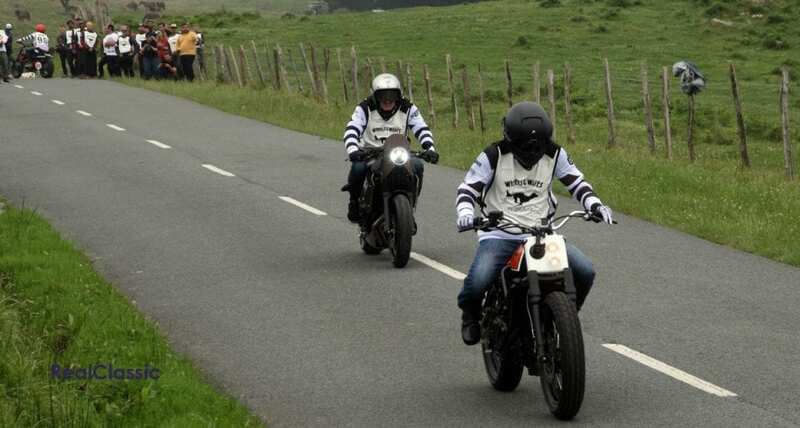 Wheels & Waves is now a seriously large event: it is spread over two countries, although it may be argued that it is only in one region. Confused? The main centre, the Village as it was known, of Wheels & Waves 2017 was to be found at the Cité de l’ Océan and Surf Museum on the southern edge of Biarritz, France. The dirt track race ‘El Rollo’ was held at the Hippodrome de Larste, San Sabastien, Spain. The surfing contests were held on Milady beach, just below the main site, France. Artride was held in Casa Ciriza, Pasia, Spain. The skateboarding competition was held at various locations in the festival village, Biarritz, France. The sprint races, ‘Punk’s Peak’, were held on the slopes of the Jaïzkibel, Spain. The music and the film festival were at the main site, Biarritz, France. All of the above are very firmly in the Basque region, which definitely has an identity that transcends both countries. When I arrived at my accommodation my host asked if I’d ever been to the region before. I waffled about visiting places at the eastern end of the Pyrenees. That was greeted with a snort of derision. No, I was now in Basque country and whilst I was very welcome, I should remember that neither Paris nor Madrid had any authority here … unless the Basques allowed it. For my part I found the area charming and the locals very welcoming, but I was aware that it was a politically discrete area. So, what might be called a moto de collection? 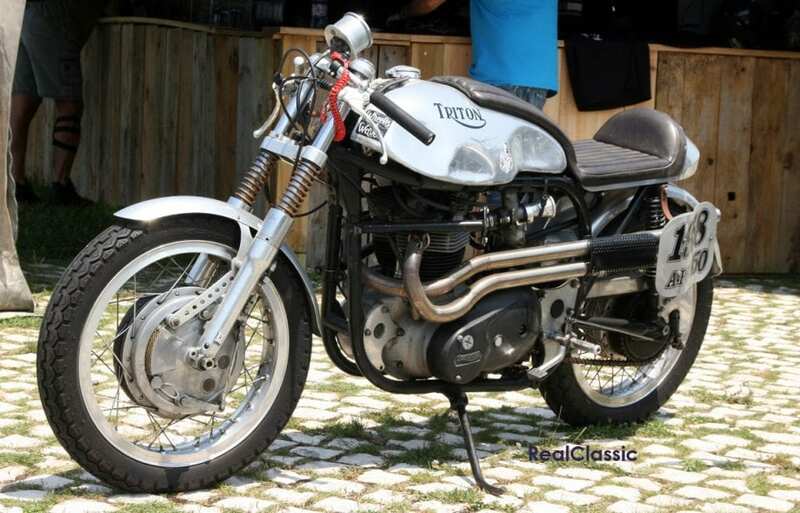 Which bikes attracted the most attention? The answer was a wide variety; I’ll take evidence for this from the car parks, as well as the show itself. Actually I often find the car parks at motorcycle gatherings absolutely fascinating and that they frequently have much more interesting ‘exhibits’. 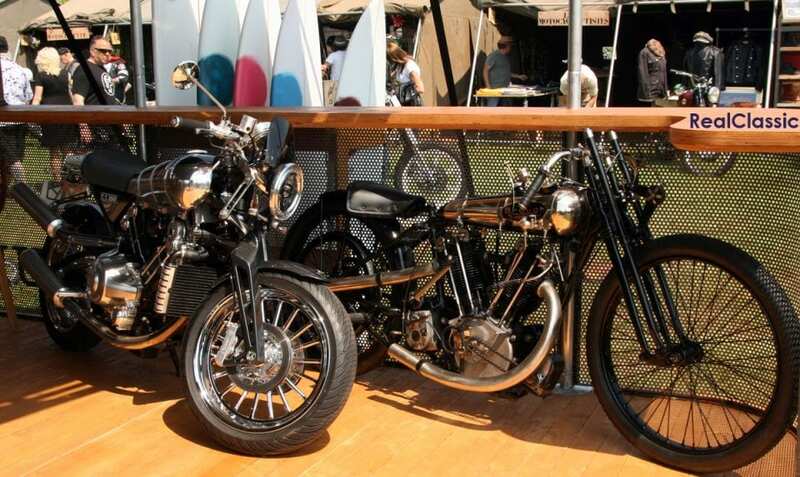 Another thing to bear in mind: Wheels & Waves exhibits are not fixed, as they might be for the NEC or Stafford shows. Here, bikes that are being exhibited are likely to be taken away to compete in a race, or to be shown at Artride, or just for a blast! If you go to the main village on several days then you are unlikely to find the same bikes there on each and every day. Back to the question: what sort of bikes? There were old bikes, some of which would have easily won a concours d’elegance, some of which were definitely used and patinated. 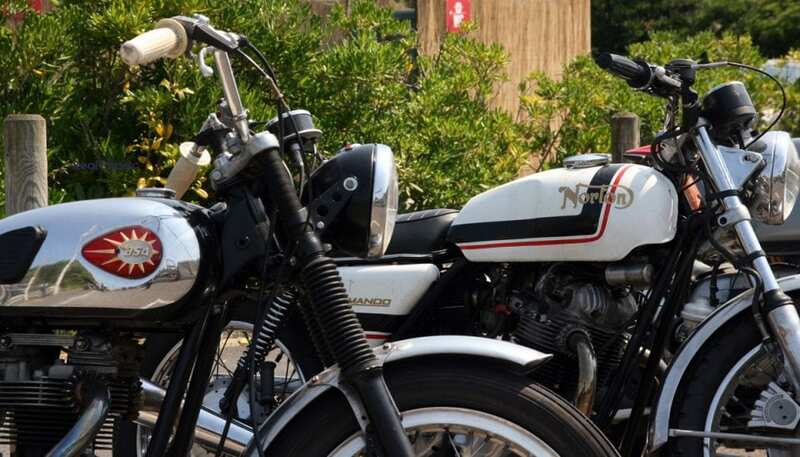 You could tell that many of the bikes came from regions that had a climate that was gentler on the fabric of the bikes that the UK as there were lots of older bikes that were obviously repaired and maintained but had not been restored. 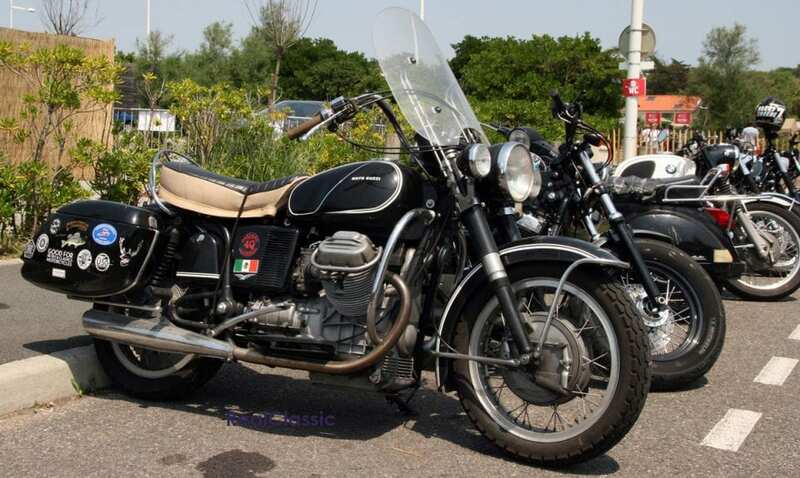 It was also noticeable that smaller bikes were equally prized: there were many 250s and 125s whizzing about. 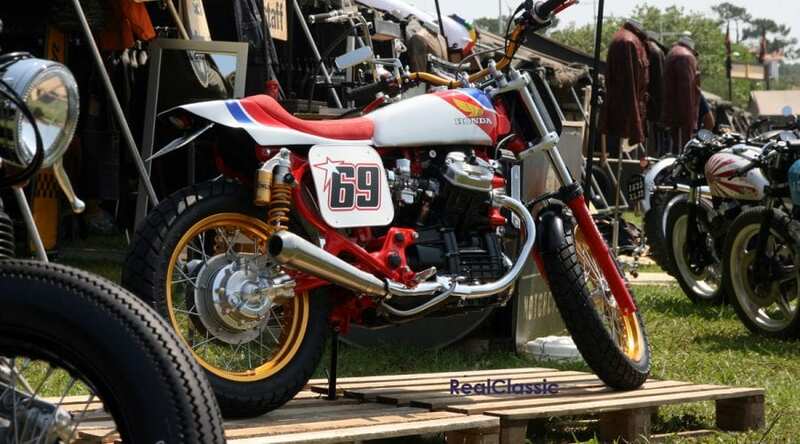 There were plenty of new bikes: BMW, Ducati Scrambler, Avinton, Honda, Yamaha, Harley-Davidson, Moto Guzzi, and Royal Enfield all had stands at the show where there were a mixture of their new models and customised bikes. Yup: they were all cool bikes! The Sterling was one particularly interesting little bike. 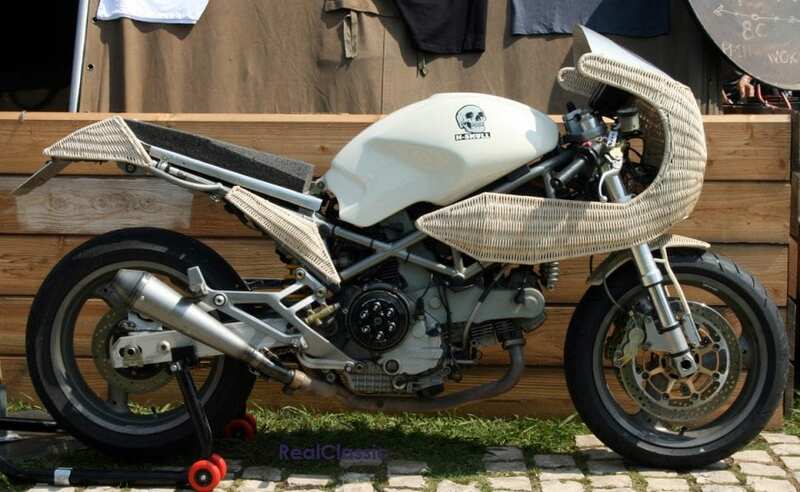 This looked like an old flat-tank styled bike but is in fact a modern homage. They are made in Italy by the Black Douglas Motorcycle Co. They make the bikes to look like a 1920s machine, including using girder forks but they are engineered to comply with modern safety. So, where they have had to use a modern wiring loom, they have then spent a lot of time hiding the wires so that it still looks authentic. 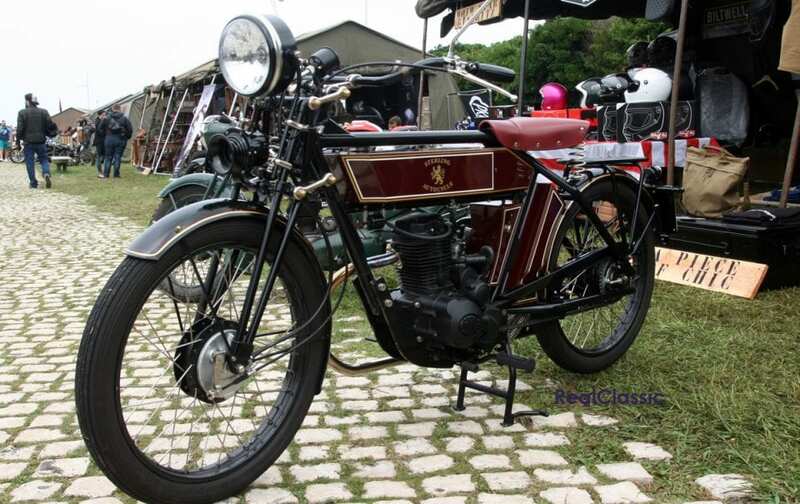 As you might imagine, a 1920s engine isn’t acceptable, so they have modern, four-stroke singles in either 125cc or 230cc sizes. A stunning thing to look at and yours to buy, brand new, if you want. Just don’t expect it to be cheap. In addition to the bikes there were a number of four wheeled (and more) vehicles to look at as well. Again these were all selected because they were cool. Even the Citroën Méhari looked cool. Once again it was obvious that many of the vehicles came from areas where the tin worm is not as virulent as it is in the UK. As you might imagine the VW campervan was well represented, but what I hadn’t expected to see were so many American vehicles, especially the big pick-ups. It was rumoured that the organisers made a conscious effort to reduce the number of stands at the village this year. That said there were over 80 exhibitors. 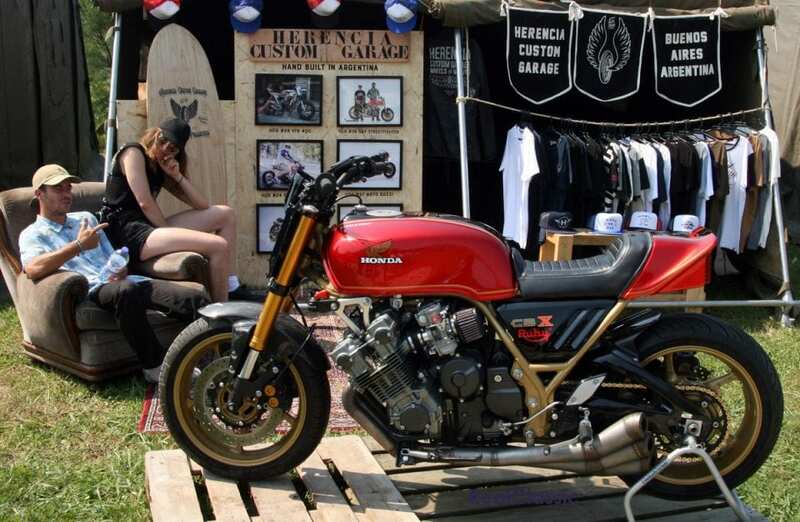 As well as the modern bikes I listed above there were several custom bike builders who, without exception, had some very tasty creations to lust over. There were also lots of clothing stalls; these varied from high-tech motorcycle wear to high-fashion hipster wear. Whilst the quality of the clothes was superb the prices did tend to elicit the Yorkshire war cry … How much!? I’m not paying that for that … and so on. To be fair the prices were not extortionate, but quality costs. There was also a fantastic choice of food and drink available. I think if you looked hard there might have been a burger and some chips available, but there were also some fantastic alternatives available. My favourite stand was the Beach House van; they produced some smoothies that were meals in themselves, and the rest of their food was all beautifully light, crisp and fresh. 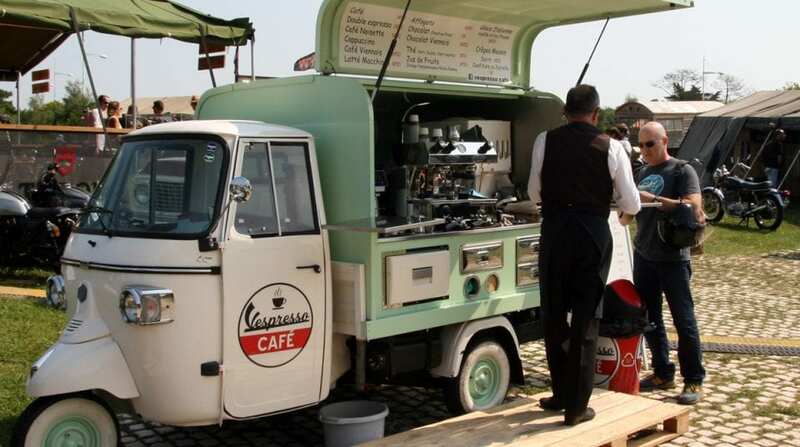 Light years away from the donkey burger and soggy chips you often seem to find with UK outdoor catering vans. Sadly I didn’t make it to El Rollo, the dirt oval racing at the Hippodromo San Sebastian Lasarte Oria. If you want to get a good idea of the carnage, have a look at some of the excellent films on YouTube. 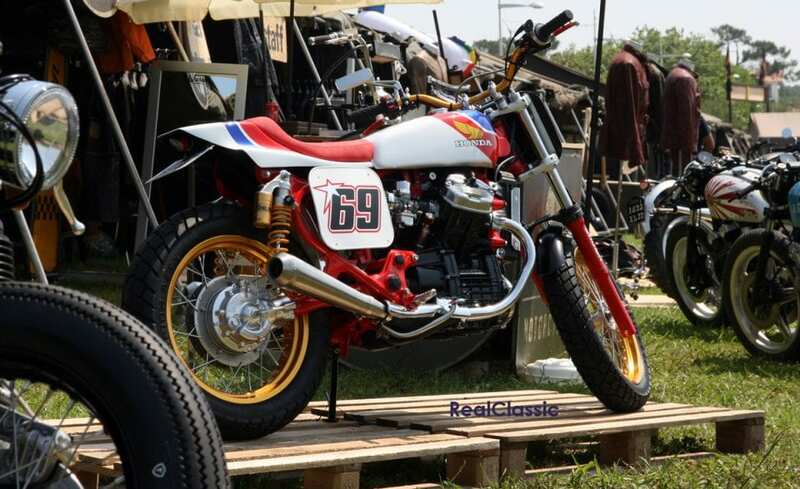 There were several classes of race to compete in: Rookie (max 400cc), Vintage (less than 500cc), Vintage (more than 500cc), Modern (less than 750cc), and Super Hooligans. To say that the bikes raced were disparate would be an understatement. Not only that, many of them were never designed to race, let alone race on a dusty dirt oval. The competition was all the better for that. Whilst the biker boys and girls were out plying in the dirt, the surfers were competing on Milady Beach, just below the main village. Now, you’re going to have to forgive me here as I have no idea what goes on in a surf competition … I don’t think it can be the first one ashore wins! From the programme I know that there seemed to be several competitions taking place, for example ‘thirsty fins’, and the ‘Log Invitational’, and for the first time there was a belly board competition. It also seems that the competitors were allocated a board that was randomly selected; does that make a difference? I dunno. As I say, despite spending some time watching I couldn’t work out how you were supposed to win, although I did guess that falling in wasn’t helpful! Thursday evening the Artride exhibition opened in an old cannery in the port of Pasaia. This was brilliant and introduced me to a bunch of artists that I’d never heard of before. In no particular order there was Franck Margerin, a French cartoonist who draws Lucien, the most famous French rocker in comic book history. His work I was familiar with, but not his name: if you spend any time in French bookshops you cannot fail to be aware of their love for cartoon books. Franck’s work is always prominently displayed. Steve Caballero was there too: he is famous as a skateboarder but is also recognised as an artist and musician. An American, Richard Vincent, had a display of films and photograph from his exploits from the late 1950s to 1967 when he went to Vietnam. 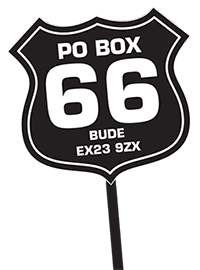 There he was injured and on his return there was no more motorcycling, no more surfing, and no more films, so his part in the exhibition was an insight into the ‘endless summers’ he once enjoyed. There were lots of longboards that were created by Daniel Creignou and the collection of artisans, Pukas. In a different style of wood shaping there was an exhibition of guitars by Nicholas Barbe. As you can imagine there were lots of bikes to drool over, each with its own history. Then there was the El Solitario exhibit of the ‘Desert Wolves’. A tower of truly frightening caged beasts! On the Friday the focus shifted to the Jaïzkibel, in Spain, for the Punk’s Peak races. An improbable number of people decamped to some soggy fields either side of a small road on a big hill to watch a series of sprint races. The fields were shared with the local livestock, which meant that you needed to pay attention to where you were going to put your feet! Once again, the racing was not altogether serious. In fact the competitors in the first category, La Copita, were anything but serious. A Copita is a small brewing glass and then bikes in this class seemed to have a maximum displacement of 125cc. After that was the pre-1950 class: the sight and sound of a Brough Superior being put through its paces by Mark Upham, custodian of the modern Brough Superior marque, was fantastic. 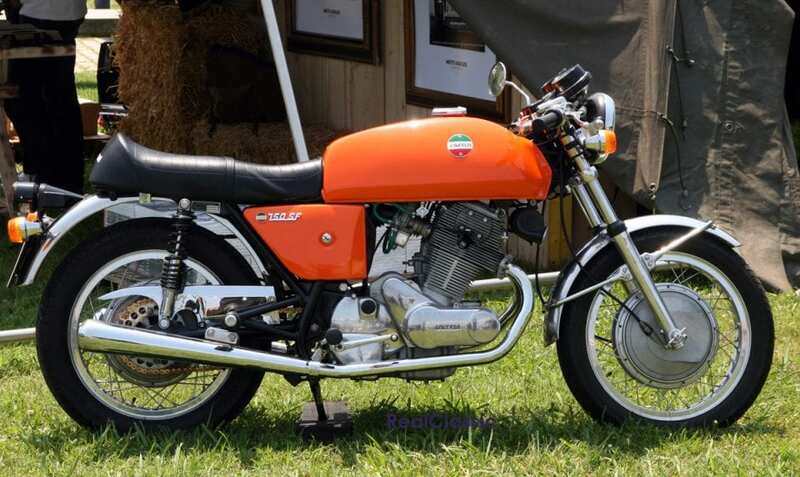 Then there was the pre-1975 class, the post-1975 class (less than 1000cc) and finally the Superbikes. Each successive class became a little more serious but, from what I could see, it was the fun of taking part that drove the competitors. Winning was just a bonus. If all of that wasn’t enough excitement, during the week the Cité de l’Océan hosted a series of films. These were all centred on surfing, skateboarding, motorcycles and music: Wassup Rockers, The Second Act of Elliott Murphy, Crystal Voyager, Today is a Good Day, Sugar and Spade, and Surfer’s Blood. Then, in the evening, there was a stage and music from: Elliott Murphy, Moon Duo, Optimo, Tom Curran, and Rocco Deluca. You’ll know all of these, of course. I didn’t; I just concluded that I’m no longer hip enough to be allowed out in polite society. If all that wasn’t enough (again! ), on Saturday there were three organised rides; 145km, 245km and 300km. All routes criss-crossed the Franco-Spanish border on several occasions as they meandered through the Pyrenees. Although I didn’t join them, I did ride many of the roads that were used and the scenery was spectacular, the roads were excellent. 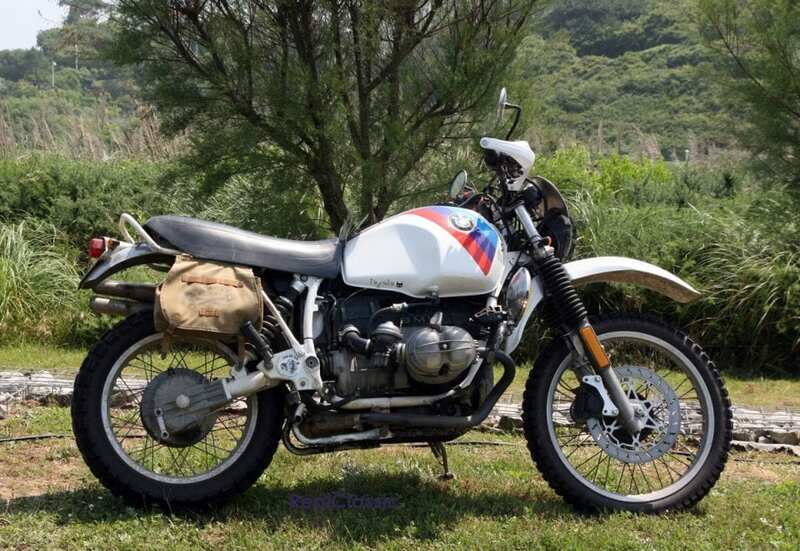 All in all a true treat for motorcyclists. I hope that gives you a flavour of this magnificent happening. What my poor prose struggles to convey is the atmosphere that is generated when many thousands of bikers, surfers, skaters, musicians and art lovers from all over the world gather together to hang out and have a good time. From all over the world? Yup, I certainly heard several American accents, some antipodean accents, and most European languages. There were bikes from all over Europe, including bikes from Russia. Pretty much everywhere you went in the region there were big groups of bikes and bikers trundling about making their way to and from Wheels & Waves events. During the whole five days I didn’t see any accidents, nor did I see any members of the public being upset, nor the police having to take any action. There didn’t seem to be many breakdowns either: there is a limit to how cool you can look at the side of the road with a broken bike so I suppose that made sure that had their bikes in tip-top condition. Would I recommend it? You betcha! 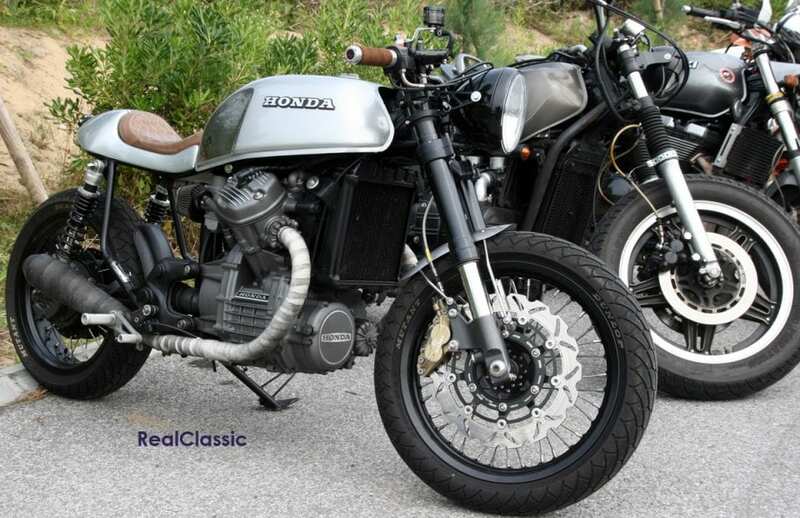 Although Wheels & Waves isn’t specifically a classic bike event there are lots and lots of classic bikes to drool over and plenty of bike related entertainment. Not to mention the location, which is in a beautiful part of the world. Or even to consider the fantastic twisty roads that you can explore. Nor to think of trying the fantastic gastronomy. Look: just go!